This is the 1998 Finnish version of The Fallen Man, published in Helsinki by Otava in 1998. Translated from English by Ilkka Rekiaro. This is a hardcover book with no dust cover. The cover art is by Peter Thorpe from the original English language edition of the novel. 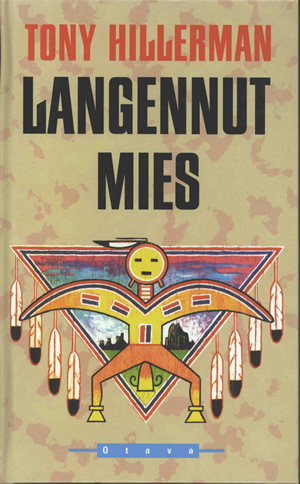 The design features a pictorial representation of a Navajo Yei figure in front of an upside down triangle with feathers hanging from the sides. The back cover is beige, with a black band extending over from and along the spine. The Crime Club logo is at the top, above a synopsis of the novel and brief author biography, with the barcode and the publisher's name at the bottom. Binding: Glossy coated boards. On the spine, the Crime Club logo is printed in red on a black background, above the author's name and title printed in white.